Breastfeeding and ever felt like you'd love it if – sometimes – someone else would be able to take a turn with the feeding? Or bottle feeding and find that it would sometimes be handy to be able to make use of your hands while you are doing so, be it to tend to your other children or maybe even hold a book to read? Well, your prayers have been answered, mamas. Say hello to the Beebo – the hand bottle holder designed to enhance and simplify feeding time for you, your baby and your family. As you can see from the video, this nifty gadget frees up a hand during feeding, meaning it is perfect for parents who bottle feed with pumped breast milk or formula, and even means that dad can be more hands-on with feeding times too. Even better? 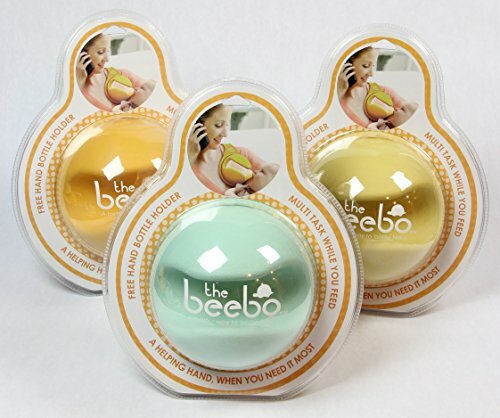 The Beebo fits any bottle, is super-easy to clean and compact for storage puposes– oh; and is completely safe for baby too, being 100 percent BPA-free, Phthalates-free, PVC-free and lead-free too.